I love baked potatoes. Whether we are having them as a side dish or using them as an entree, baked potatoes are an excellent frugal food choice. Potatoes are very nutritious. When eaten with their skin, they contain potassium, fiber, and vitamin C. In fact, one medium potato contains 45% of the daily allowance for vitamin C. For such an inexpensive food, potatoes are pretty awesome. 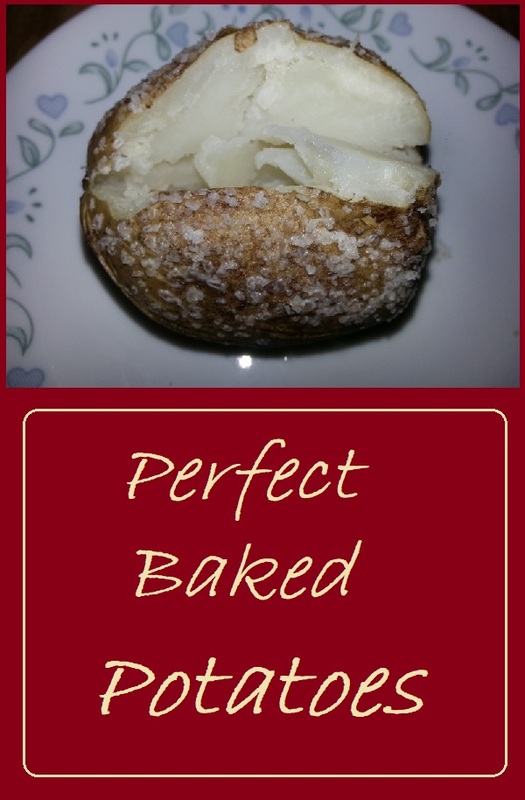 In our household, Baker’s Man has come up with a way to bake the potatoes which we refer to as the Perfect Baked Potato. The best part of this recipe is that it requires no wrapping the potatoes in foil, and his technique really adds flavor to an otherwise bland vegetable. It’s really very simple. Wash the potatoes and towel them dry. 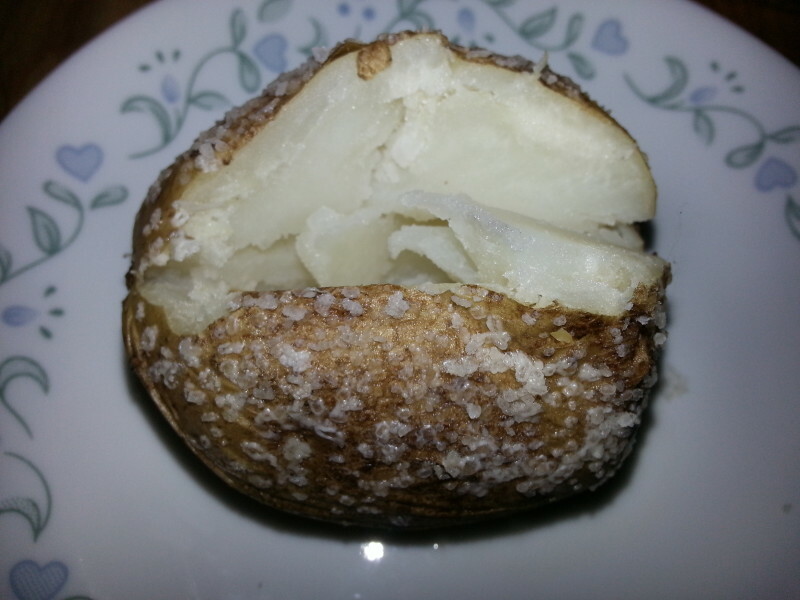 Rub each potato with 1/2 to 1 teaspoon of olive oil, then sprinkle the oiled skin with coarse sea salt or kosher salt. Place the potatoes into a baking dish or onto a cookie sheet. Bake at 350 degrees for approximately one hour. You will know that the potatoes are done when they yield to pressure from your fingers and you can squeeze the ends together. To serve, slice the potatoes open lengthwise along the top then push the ends together. This breaks up the potato flesh inside. Season with butter, sour cream, chives, or whatever you prefer on your potato. These potatoes are great with the perfect steak, beer can chicken, roasted chicken, or as a stand alone entree topped with your favorite toppings. Give them a try and let us know what you think. Thanks for visiting Patty Cake’s Pantry. These baked potatoes are a perfect accompaniment for a meat dish or as a stand alone entree when topped with things like chili, broccoli and cheese sauce, or taco fillings. Total cost of recipe is $1.83 or about $0.31 per serving. Rub each potato with ½ to 1 teaspoon of olive oil. Sprinkle each poato with salt. Arrange potatoes in a single layer on a cookie sheet or in a baking pan. Place in a 350 degree oven and bake for 1 hour until potatoes are tender and yield to gentle pressure. Nutrition information is for one medium potato prepared as above.